This weekend's Person-of-Mystery was Craig Breedlove, five-time land speed record holder in his car, Spirit of America. 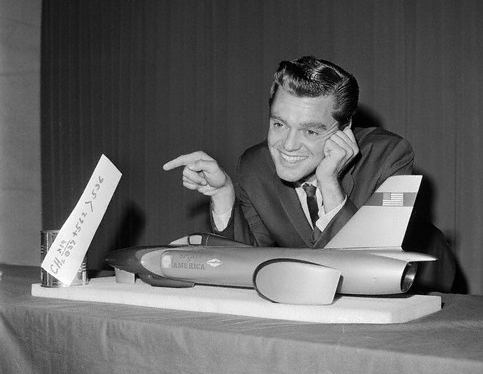 He holds the distinction of being the first man to go faster than 400 mph, 500 mph, and 600 mph. And while it's not one of their better songs, the Beach Boys' song "Spirit of America" is also about Breedlove. Well, he sure doesn't match my image of a speed car driver and then that airplane tail threw us off. You win, Nate! Thanks Nate. Great misdirect with just showing the tail. My favorite Breedlove story is one time when he was testing a new car and he lost "the line" and went tearing out across the salt flats. With the chase/rescue vehicles hot in pursuit, he hit a bump, got airborne and did a lawn dart into a small pond/lake. He got out of the car and swam to shore, just as the rescue cars arrived. He took off his helmet, said, "And for my next magical trip, I'll set myself on fire." and promptly passed out for three days. May be apocriphal, but it's still a wonderful story.